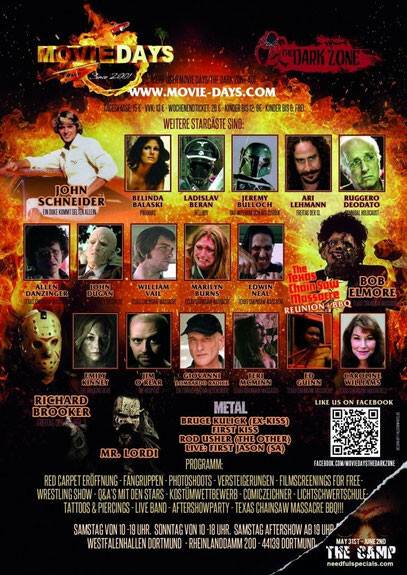 MOVIE DAYS 2013 - duckys-autograph-worlds Webseite! The main reason for me to go there was John Schneider. And he was really worth it! He is a really sympathetic and nice guy, very close to the fans. I also met some members of the German Dukes fan group and I had a lot of fun with them. In fact, I joined their forum just after the con. Unfortunately, not everything at the Movie Days was as it was planned to be, the organizers had some unespected troubles, but they are not to blame for it. I was angry first, but when I learned about the circumstances, I had to say, they made the best out of it. I fetched the autographs of John Schneider, Robert Englund, Dave Prowse and Jeremy Bulloch. I also planned to visit John's Q&A but for reasons unknown to me it was cancelled.